BRIEF CAMP DESCRIPTION: Camp Big Heart is an overnight summer camp for campers with mild to moderate special needs, sponsored by the Civitan Clubs of Georgia. Campers are invited to join us at Camp John Hope for a week-long session this summer. The dates for 2017 are Session 1 June 11-16,(School age) Session 2 June 18-23,(Young Adults and Higher functioning) and Session 3 June 25- June 30, (Older Adults- max age 60). Campers enjoy Making many new friends and having Fun!! Most Campers return again and again each year and form special bonds with fellow campers, staff, and volunteers. We would love for your camper to join the Camp Big Heart Family today!! 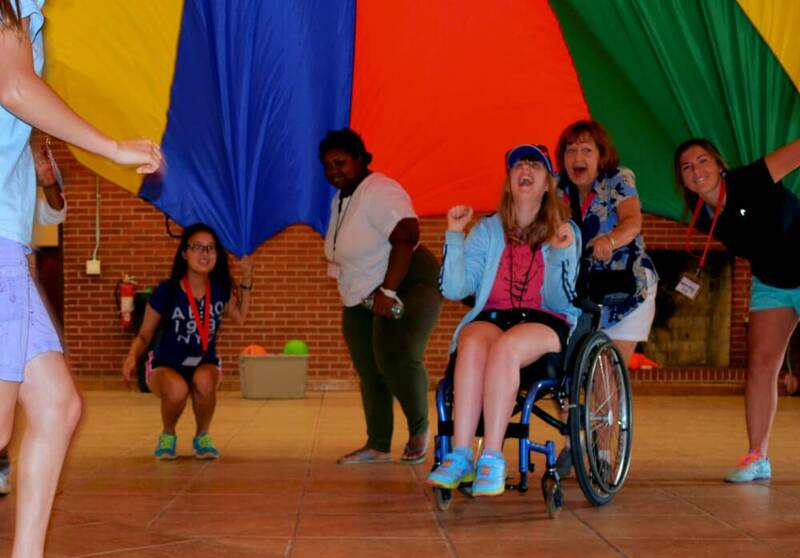 SPECIAL NEEDS CAMPERS: Camp Big Heart offers a wide range of programs enabling campers to transcend disabilities and develop new skills and friendships while maintaining their Camp Big Heart friendships from prior years. Activities Include: Pool Time, Water Games, Archery, Arts & Crafts, Physical Games, Nature Exploration, Music & Drama, Talent Show, Carnival, Dance, Fishing, Boating, Cooking & Life Skills, Talent Show, Awards Ceremony Dance, Much More. Dance, Theater, Music/Band, Fine Arts/Crafts, Soccer, Swimming, Waterfront/Aquatics, Team Sports, Wilderness/Nature, and more. CAMP LOCATION: Traveling North or South on I-75 take Exit 135 (Perry-Marshallville). Travel West on GA 127/224. At approximately two miles from I-75, GA 127/224 will split. Keep to the right on GA 127 (you’ll see the Camp John Hope sign) for approximately five miles. Turn right onto Camp John Hope Road and travel approximately one mile, turn left onto Hope Entrance Road. The office is located in the T G Walters Hall. Details: These cabins have a very unique design and offer great versatility! Each building has two identical sides that can be joined or separated by a locking divider door. Each side of the buildings has 2 private rooms separate from the bunk area, ideal for group leaders. Additionally, all bunks are built in pods, making them more private than traditional bunks. Camp Big Heart has a 24 hour security staff. Camp Big Heart, in existence since 1984, is a unique boarding summer camp which offers a broad range of recreational activities designed specifically for children and adults who are mildly to moderately mentally challenged (who may also have physical challenges) and who are ambulatory. It is recognized as one of the truly outstanding camps of its type in the country and serves the entire state of Georgia. Our mission is to provide the highest quality summer recreational camping experience for Georgia’s developmentally challenged children and adults. Camp Big Heart has over a 30 year history of providing safe, affordable, high quality, individualized and group camping programs staffed and supervised by committed and caring professionals in the field of human services. There are countless planned activities and entertainment throughout the week, including pool time, water games, archery, arts & crafts, sports, and many more. Our staff brings the fun. The Camp Big Heart staff is energetic and passionate about camp, so every moment is a possibility to have fun. Each camper gets to choose his/her own Discovery activity for the week. Each camper gets a superlative trophy at the end of the week celebrating their contribution to the cabin. We keep our campers moving! Campers exercise and experience the outdoors. Every cabin goes to six activities throughout the week, where campers try new things and learn new skills. Our staff becomes extremely close to each one of the campers in their individual cabins throughout the week. Campers often become best friends with the other campers in their cabin by the end of the week. Every camper is encouraged to help the clean the cabin and tables at mealtimes as their abilities allow. Many of our campers help each other by opening doors, pushing wheelchairs, and helping each other get ready in the morning. Throughout the week, campers enjoy a boat ride, sit back during nightly entertainment, and get a midday rest as a break from the summer sun. Both campers and their parents and caretakers take a break from their normal routine by letting Camp Big Heart plan all of the fun. and older adults many of whom are professionals trained in the fields of therapeutic recreation and special education. appropriate organization to ask for funding and to complete the necessary paperwork. FAMILY CAMP SESSION(S): We have a medical team of nurses, nurse practitioners, and physicians who are experienced with working with our camper population. They work out of our on-site medical lodge and there is always someone on call in the medical lodge. Our medical staff will store prescribed medications in the medical lodge. Our counselors will bring campers to the medical lodge for their meds as needed. participate in activities with the same group. We would love for you to join the Camp Big Heart Family this summer! Camp is an extremely fun, rewarding, and exhausting experience. We have an over 70% retention rate every year, so apply early to guarantee your spot. Applications are Due in April each year please visit our site at Our Camp Website Link: campbigheart.org for more information and Apply now! Go to The Best Georgia Summer Camps Directory to Find More Top Summer Camps Near Marshallville, Georgia.